Most of the movies I review here are of the horrific persuasion, but I'm breaking tradition because I've recently been on a western and war movie binge — mostly stuff from the 1960s. 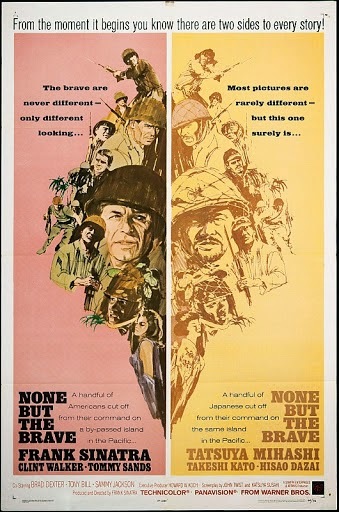 None But the Brave is a 1965 American-Japanese co-production directed by and starring Frank Sinatra, and featuring a few recognizable names in both the American and Japanese casts. Sinatra himself plays a supporting role as a booze-swilling medic, with Clint Walker (The Dirty Dozen, Cheyenne, Killdozer, Scream of the Wolf, et. al. ), Tommy Sands (Babes in Toyland, The Longest Day, Ensign Pulver, et. al. ), and Tatsuya Mihashi (The Bad Sleep Well, Tora! Tora! Tora!, The Human Vapor, et. al.) taking the lead roles. The film does have a clear connection with my favorite monster movies in that the Japanese part of the production comes courtesy of Toho Studios, featuring special effects by Eiji Tsuburaya and starring several Toho "regulars," including Mihashi himself; Kenji Sahara, veteran of numerous Godzilla and other daikaiju films; and Susumu Kurobe, best known for his portrayal of Hayata in the original Ultraman series. A young John ("Johnny") Williams provides the musical score. The movie tells the parallel stories of two platoons, one Japanese Imperial Army and the other US Marine, both stranded on the same remote island in the Solomons, the former simply left behind as the Japanese military retreats farther and farther north, the latter the survivors of a US Navy R4D transport shot down by a Japanese Zero. The two ranking American officers, Captain Dennis Bourke (Walker) and Lieutenant Blair (Sands) initially clash over command of the unit, with the more seasoned Bourke advising a strong defense and the use of guerrilla tactics and Blair advocating a full-on frontal assault against the enemy, which Bourke claims will end in their own defeat. Eventually, Bourke's toughness and no-nonsense approach earn him full command. The two enemy forces engage each other, each inflicting a few casualties on the other. During a reconnaissance mission, the Marines discover that the Japanese are building a boat in order to escape the island. The Marines attempt to capture it, but rather than have it fall into their enemy's hands, the Japanese destroy it. During the fighting, a Japanese soldier named Hirano (Homare Suguro) suffers a leg wound that turns gangrenous. Japanese commander Kuroki (Mihashi) meets with Bourke and offers a truce between them if the Americans will send their medic, Maloney (Sinatra), to perform surgery. Bourke agrees to the terms, and Maloney — in reality, only a pharmacist's mate — is forced to amputate Hirano's leg in order to save his life. While the Americans and Japanese maintain their uneasy truce, which is to last as long as the war continues to pass them by, the monsoon season begins, and the two adversaries discover they must work together and build a dam to prevent the spring that supplies their fresh water from being submerged beneath the rising ocean waters. The endeavor is successful, but the Americans have managed to repair their radio transmitter and contact their HQ, which sends a destroyer to rescue them. With the war now returning to their little island, Bourke offers to accept the Japanese's honorable surrender, but Kuroki refuses, stating that he and his men would rather die than become prisoners of war. And as the Americans prepare to evacuate the island, Kuroki's men attack and kill many of the Marines, though, in the end, it is they who are, to the last man, wiped out. In the 2000s, director Clint Eastwood received critical acclaim for his war films, Flags of Our Fathers and Letters From Iwo Jima, which told the story of the Battle of Iwo Jima from the American and Japanese points of view respectively. To some extent, those movies mirror the themes from None But the Brave, which portrays individuals on both sides as sympathetic, exhibiting both dignity and weakness, their focus on personal honor and duty. Sinatra's movie articulates a distinct anti-war sentiment, which comes off as both heavy-handed and occasionally cheesy, though there's no question of its sincerity. The character of Kuroki narrates the movie — by way of personal journal entries — portraying himself as a soldier by duty but a noble romantic at heart. As his American counterpart, Bourke is a man haunted by having lost the love of his life in a Japanese attack just before proposing marriage to her. He proves himself a capable leader and fierce fighter, but as he gets to know Kuroki, a long-repressed compassion for his fellow man begins to surface. At the climax, as the Americans are preparing to evacuate and the Japanese refuse their terms for surrender, Lt. Blair tells Kuroki, "We wouldn’t attack you, Lieutenant." Kuroki replies, "I would! The truce is ended. I belong to the Imperial Japanese Army. Until my country advises otherwise, I remain at war." These lines seal the fates of both sides, and the deaths of both the Japanese and the American soldiers — men who had worked together for their mutual survival — hit pretty hard, despite the rather static staging of the battle scenes. Heavy-handed though it may be, it's an effective, moving statement that these men's sense of duty — their nationalism — supersedes their basic humanity. Sinatra may not be the world's finest film director, and a certain amateurishness to some degree undermines the story's solemnity, but the movie is colorful, with fair pacing and more than competent acting, especially from the Japanese cast members. The special effects by master Tsuburaya often shine, exhibiting the distinctive and appealing visual style of the best of his tokusatsu films. The aerial dogfight early in the film is very clearly done with models, but these are beautiful models, the flying scenes realistic enough to be visually exciting. The raging monsoon, which floods the island and finishes off the Marines' R4D transport, brings to mind the brilliant storm footage at the beginning of Mothra vs. Godzilla (a.k.a. Godzilla vs. the Thing). Unfortunately, John Williams's score — like most of his early film work — comes off as nondescript, ultimately forgettable. It is fortunate that over the course of his scoring career he matured with style. I admit to having more than a soft spot for None But the Brave, for purely nostalgic reasons. Back in the summer of 1970, the movie aired on television on a Friday night — a most memorable Friday night, a night that I spent over at my friend David Hare's house. It was the night before the Saturday that we went to see the daikaiju double-feature War of the Gargantuas and Monster Zero, and, in my lifetime, rarely has there been an event more indelible in my mind. A World War II film featuring Toho regulars and special effects by Tsuburaya made for the perfect appetizer for the upcoming main course. None But the Brave may be far from a great film, but it's a strong film, with good performances, some fine visuals, and a moving theme. If you're one of those unfortunate (or perhaps very fortunate) souls who have never made the acquaintance of Other Gods, then permit me to introduce you. Other Gods is my biggest and — in my thoroughly objective, non-biased, reasonably informed, and ultimately irrelevant opinion — probably best collection of short fiction. 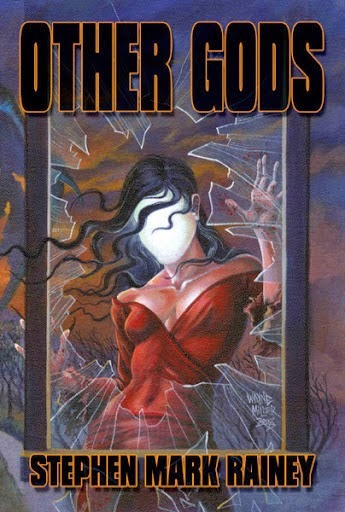 It contains sixteen of my horror tales written between 1986 and 2008, there or about, some linked by common characters and settings, most dealing with dark, deadly, unknown forces — hence the "Other Gods" of the title. Dark Regions published the collection in 2008, with beautiful cover art by M. Wayne Miller, whose work graces the covers of several of my books (not to mention a number of issues of Deathrealm back in the day). I wanted highlight a particular story here, as people sometimes ask me what I consider my scariest story. For me, that's a difficult determination to make, but based on feedback from readers over the years, I'm inclined to say that story is "Silhouette," which was originally published in Cemetery Dance #24 (Summer 1996). “Silhouette” draws on some old, old personal fears, going back to when I was a kid and dreamed of a faceless, stick-like creature that came bouncing up our basement stairs to pursue me. Also included in the imagery is the silhouette of the title, based on a rather disturbing visual I spied in an old brownstone apartment window when I visited Chicago in the late 1970s. Another scene is drawn from one of the only true night horrors I ever had, which occurred early in my college years and kept me awake for an entire night. The event that actually brought the story into being, however, was something of an academic exercise. 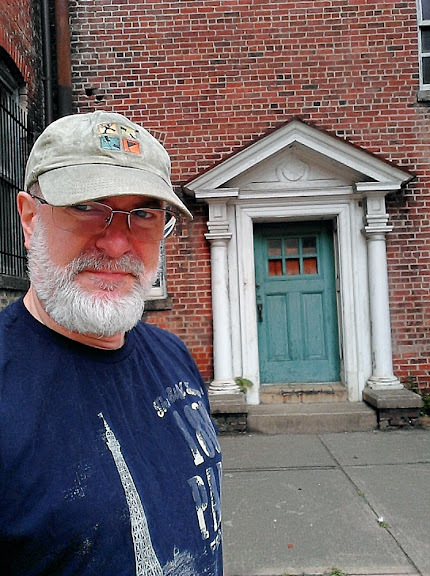 In the early 1990s, my friend and fellow scrivener William R. Trotter gave me a tape of some creepy music, which included “Hidden Voices” by minimalist composer Ingram Marshall. I found it among the eeriest stuff I had ever heard. Danielle d’Attilio, who helped me edit Deathrealm, and I decided to sit down and play the music in absolute darkness, then write about whatever came to mind as we listened. Her story was actually called “Hidden Voices.” For me, “Silhouette” was the result. And from the many comments I've received from readers who were unnerved by the story, I'd have to say it rates at the top of my "scariest story" list. "I finished Other Gods feeling as if I had been processed through the kaleidoscopic imagination of a born storyteller. Other Gods is a superb example of what this sort of long-term collection is good for: It plainly highlights the author's long-running thematic obsessions and shows him circling back to revisit and reshape the concepts, tropes, and emotions that inspire him." It's been a somewhat slower year for geocaching than others since I took it up in 2008, mainly because I've claimed most of the caches within reasonable proximity and have to travel farther and farther afield to find appreciable concentrations of hides. For a while now, I've been slowly but steadily creeping up on find number 8,000, and for that milestone, I've been hoping to go after something a little out of the ordinary. 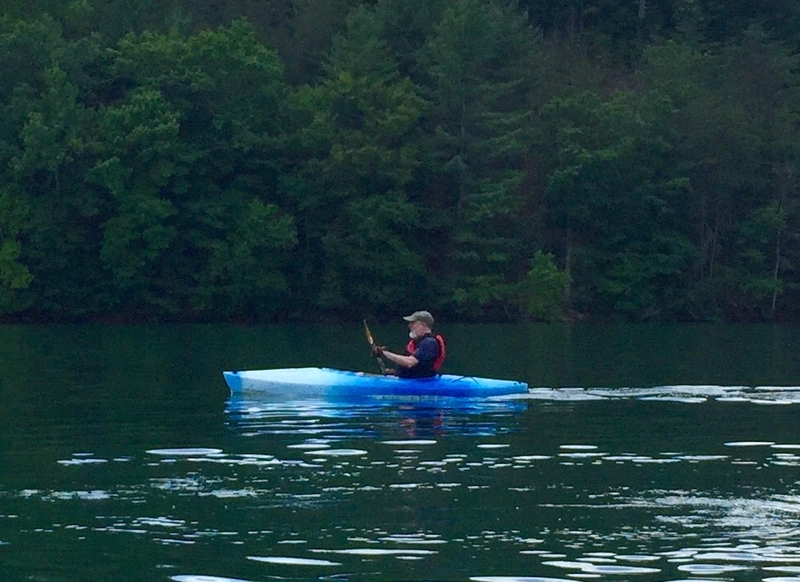 I finally settled on a cache called "All Alone in Goblintown" (GC1EAWF) at Philpott Lake, near my old hometown of Martinsville, VA. It's out on an island a good couple of miles from the nearest marinas, and it's been sitting out there unfound for the past six years. 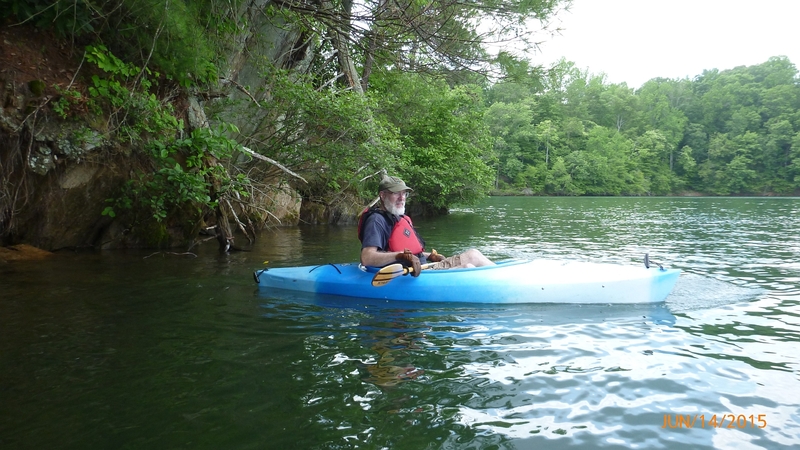 Since I do not own a boat, I'm reliant on others for water transportation, but happily, a few members of the redoubtable Team Old Fart are aficionados of paddle caches and have kayaks to spare. This weekend looked good for making the attempt, so I got together with Diefenbaker (a.k.a. Scott) and Rtmlee (a.k.a. Robbin a.k.a. Yoda Rob) to paddle out after this lonely, lonely cache. There was no telling whether the cache might still be out there after all this time, and, if so, what condition we might find it in. All part of the challenge, of course, and most of the fun of geocaching is the journey. And this one proved quite the journey: a seven-plus mile round trip, counting a detour to go after a couple of other, considerably less lonely caches. Outbound, it wasn't too hot and we had a constant breeze, which made for a pleasant morning of it. 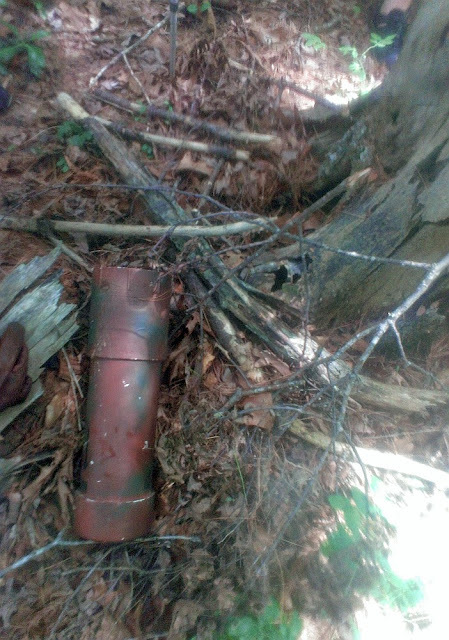 Once we landed at Goblintown, we made our way to ground zero, and there we found the cache, quite readily and in remarkably good condition. (That's the container you see in the photo above.) We all scribbled our monikers on the log, snapped a few photos, and took a break to chow on some beef jerky and re-hydrate ourselves. 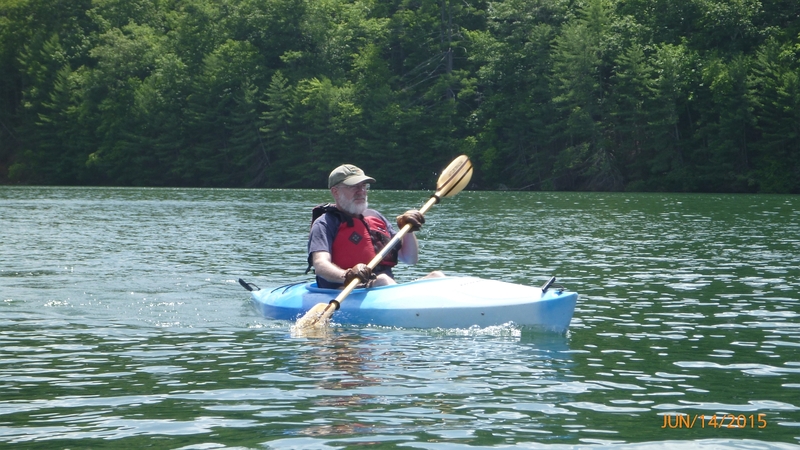 Then it was back on the water to paddle over to Turkey Island for a couple of caches there. Now the wind stopped and the sun became oppressively hot — thank ye gods for sunscreen. But for us, mission accomplished. 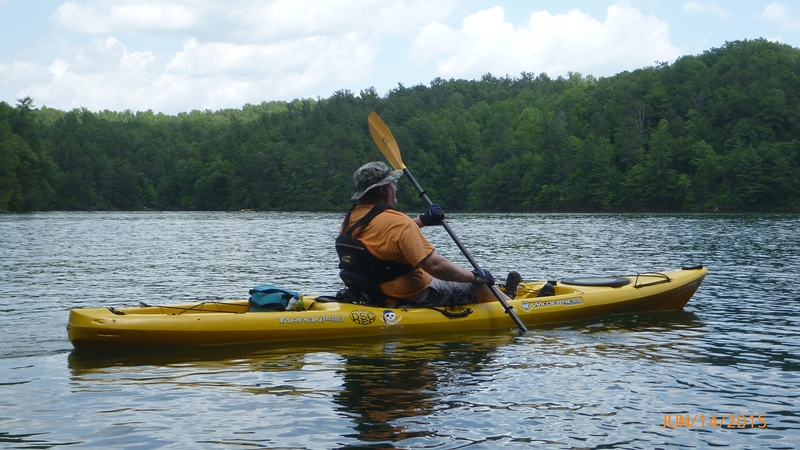 Once back at Goosepoint marina, we hit the road and, never one to rest on our laurels, Diefenbaker and I stopped to find a few more on our way back to Greensboro. Best part of the trip back — dinner at The Celtic Fringe in Reidsville, which is one of my favorite dining spots anywhere. And lucky for me, while I was gone, a number of new caches have been placed around Greensboro, so I'll at least have a few more in the area to hunt. Next stop: working on a new short story for an upcoming anthology. Never a dull moment. Old Rodan on the way to "All Alone in Goblintown"
Mission accomplished. 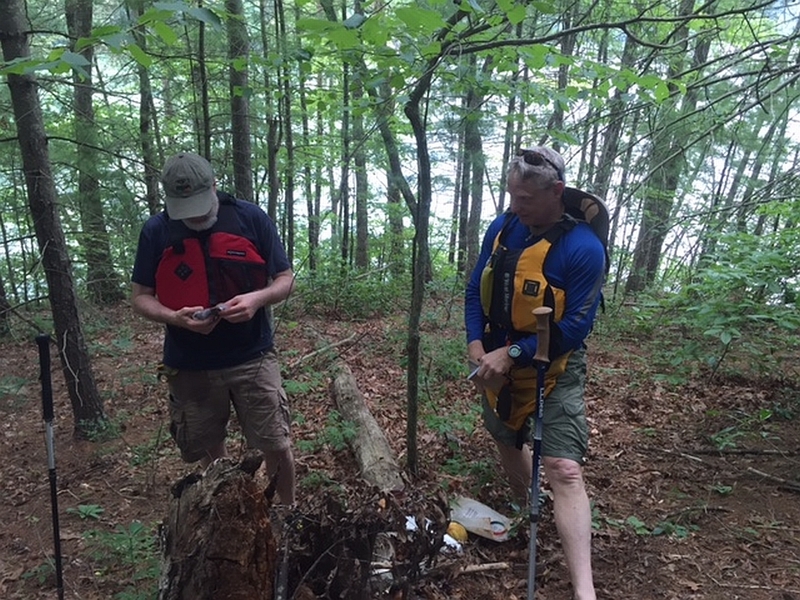 Checking out the contents of the cache. One deer: dead (R.I.P., deer). One Mazda 3: a bit cracked up. Helluva scare for Ms. B. late last night — or rather, in the wee hours this morning. Kimberly and I wanted to hit the Eden Drive-In this weekend, and as I've been in Martinsville helping look after Mum, we decided just to meet in Eden. Poltergeist and Mad Max: Fury Road were showing, which looked like a fun enough double bill. The former movie — hardly unexpectedly — was in dire need of a writer, a director, some actors... you know, movie stuff and all, and Mad Max was pretty decent, much on par with The Road Warrior. The burgers at the Eden Drive-In are to die for, by the way. (I know, I know; under the circumstances, that might not be the best use of hyperbole, but there it is.) Afterward, we departed in our respective vehicles, but it was only a few minutes later that I received a call from an understandably rattled Kimberly. 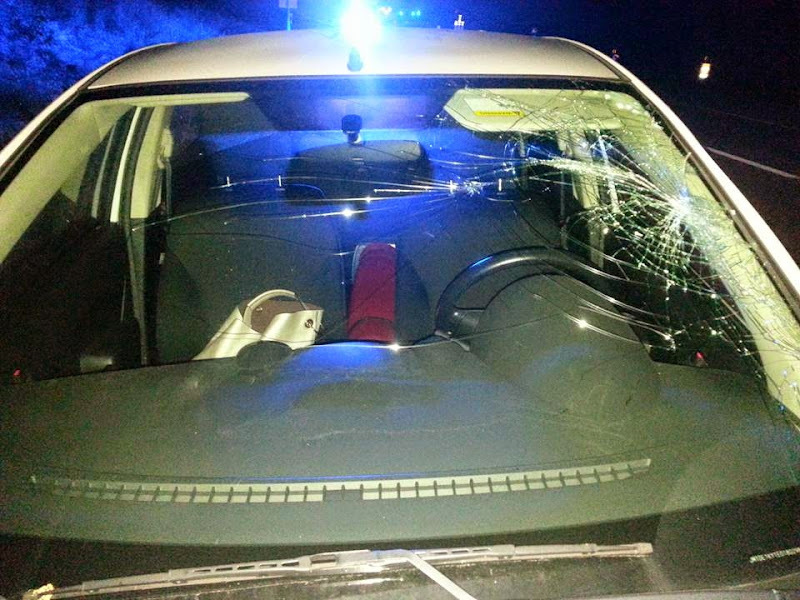 Something — she knew not what — had slammed into her car and shattered the windshield. As I hurried back to meet her, some distance shy of where she was pulled off the road, I encountered a good-size dead deer: clearly, the cause of the upset. By the time I reached her, only a couple of minutes later, a pair of officers were already on the scene. Now we got to take a good look at her vehicle, and the damage was far more extensive than it initially appeared. Shattered windshield. Broken rear-view mirror. Dented side panel. And crunched rear door. Thankfully, apart from her nerves, Kimberly was fine. The car is going to need some serious medical attention, but I reckon that's better than one of us needing it. Almost ironically, on our way to the theater, we had seen a deer bounding across the highway at top speed and remarked on it — at almost exactly the same location of her accident. Not out on a country road, mind you, but on the main highway through Eden. As an aside, it was very refreshing, after seeing so much negative about the police lately, that the law enforcement officers who responded — the local sheriff and a deputy — were prompt, sympathetic, cordial as can be, and quick to provide an official report in case it's needed for Kimberly's insurance. My hat's off to those folks. On my drive back to Martinsville, which did involve some lonely back roads, deer were everywhere, and no less than three darted out in front of my car. All of this is a stern reminder how fast the unexpected can happen, and how severe the damage can be from a single deer strike. It could have been much worse, too. The critters are out there, you know, and they might just have your number. Beware! I've been geocaching in Danville, VA, countless times; in fact, I've cached out the town more times than I can remember, only to have a wealth of new caches pop up, bringing me back again and again. 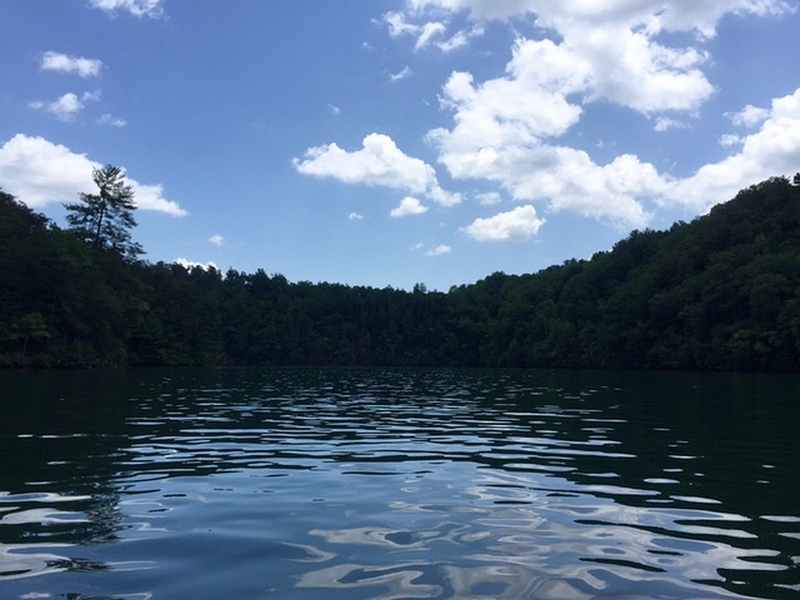 Whereas I once took Danville to be a rather drab, uninviting place, I've taken quite a shine to it— all thanks to caching, which has introduced me to countless locations I would never have otherwise experienced. Today, I had to head to Martinsville to offer my mom some physical assistance, and I did so by way of Danville, where several new caches awaited me. I'm happy to report that today's haul pretty much exemplified what caching is all about. There was a challenging tree climb; a hike in pouring rain through some mighty rugged woodland terrain — which I ended up making more rugged than it should have been, thanks to my GPS getting ornery and leading me all over the hills and hollers before settling on a stable ground zero; and a little trek through the old warehouse district, where I found a cache called "Forgotten Door" (GC5PKJ2) because, well...see the photos for yourself. 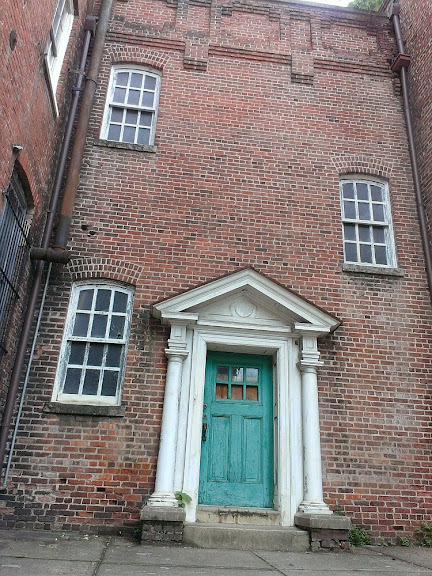 It's pretty much an old, forgotten door in a secluded, all-but-unseen alcove in a section of warehouses along the riverfront. I don't know whether this particular building is fated for total refurbishing or what, but I have a feeling no one ought to mess with it. From the noises I heard on the other side of the door, I started looking for a sign reading "Abandon all hope, ye who enter," but I couldn't find one. I'm guessing it must be around there somewhere. To end my all-too-brief run through Danville today, I stopped at Tokyo Grill for lunch, where I've often had some pretty decent sushi. Today's was absolutely awesome and though the place was jam-packed for lunch, the service was impeccable. Then it was on to Martinsville. I will say this — there are a number of highly skilled, enthusiastic geocachers in Danville who have done bang-up jobs on their wares. I hope there's plenty more to come from them. Do you see the cache? 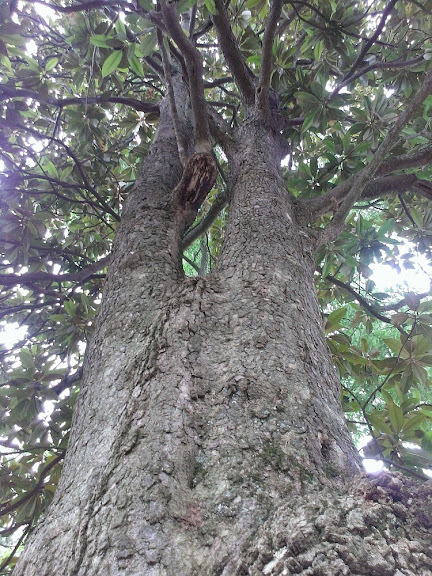 I wish I could have had a photo taken of me up in this tree. I would look pretty small. 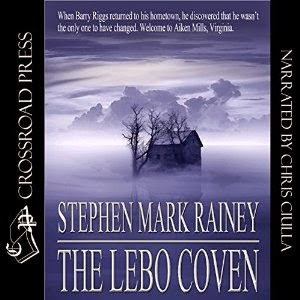 The good folks at Crossroad Press, who have previously released my novels Balak, The Nightmare Frontier, and The Monarchs as audio books, have now released my 2004 novel, The Lebo Coven, as an audio book as well. Read by Chris Andrew Ciulla, The Lebo Coven is the story of two brothers who have chosen very different paths in life but are drawn together — with traumatic results — in the shadow of dark supernatural force. There's murder, mayhem, romance, witchcraft, Satanic rituals, cattle mutilations, and beer. 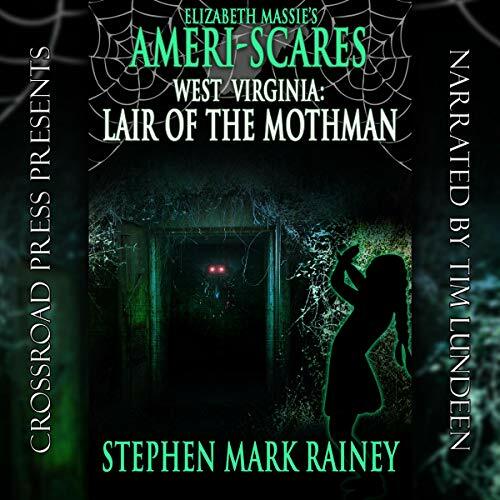 "After a ten-year absence, Barry Riggs returns to his hometown of Aiken Mill, Virginia, in search of his brother, Matt, who has mysteriously disappeared. Not only is the younger Riggs missing, but his house has been ransacked and branded with the strange word Lebo — painted in blood on the master bedroom wall. Faced with a local sheriff whose efforts to solve the crime are anything but devoted, Barry sets out on his own to discover the truth. He meets a number of locals he had known in his youth, including a young woman named Jennifer Brand, whom he had once treated with contempt because she suffered from a repulsive, crippling affliction. After some awkward moments, the two become friends, and together they attempt to unravel the mystery of Matt’s disappearance. Certain locals suggest that the name Lebo holds ominous significance, but no one will so much as whisper its meaning. Barry eventually encounters a mysterious character who goes by the name of Ren — a reputed worshiper of Satan. As Barry and Jennifer unravel the clues, they learn that all is far from what it appears — and that dark, inhuman forces truly are at work."